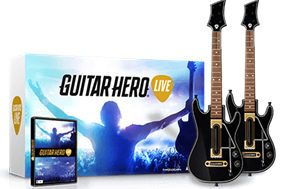 Guitar Hero Live for Sony PlayStation 4 Take to the stage and rock out to a responsive crowd in Guitar Hero Live for Sony PlayStation 4. This installment in the franchise puts you right in the action, providing a first-person perspective while you jam on small club stages and huge outdoor festival stages. Enjoy playing along with your favorite music videos on GHTV and duel other players right in the comfort of your living room or online. With a redesigned controller and fantastic Hero Powers, it's time to rock and roll! Experience the rock 'n' roll lifestyle like never before with an immersive, first-person experience. Win the crowd over or lose them with exciting, real-time crowd reactions in a variety of cool venues, from small clubs to the main stage of a massive outdoor festival. GHTV lets you play along with hundreds of the latest music videos. Pick a channel, just like picking a channel on your regular TV, and dive right in. Compete right in your living room or with other players online and rise through the rankings on the global leaderboard. The 2 x 3 button layout offers an enhanced, more realistic play style to simulate the feeling of switching strings and enable more dynamic chord playing. Access new and exciting Hero Powers right when you need them by using the guitar's tilt sensor or Hero Powers button. It's About to Get Real™ Guitar Hero® Live is here. YOU are the rock star- Playing music in front of a real crowd is like no other experience. With the new GH Live first-person view, YOU'LL take center stage like never before. Rock real crowds with real reactions- Feel the rush of performing in a REAL band, in front of REAL crowds who react in REAL time to your performance. You'll either win the crowd or lose them. Awesome music, epic venues- In GH Live, you'll take the stage in a variety of venues. Experience it all from the intimacy of a small club or the main stage of a massive outdoor festival. All playable, all the time- GHTV is a continuous broadcast of music videos where you and your guitar controller are the star. Hundreds of videos will be available at launch spanning all different genres of music, with new videos continually added to the line-up. Watch what you want- Turning on GHTV is similar to turning on your regular TV. Pick a channel and dive right in. Rock out with friends- GHTV makes it more fun to play with your friends than ever. While one person is playing, everyone else can watch the videos. Plus, GHTV doubles as a competition. Compete in the living room or online. Or, check out the global leaderboard, and see how you stack up against fellow rock stars around the world. More real than ever- The guitar controller has been updated to reflect the new style and realism of Guitar Hero Live. All new button layout-The new 2x3 button layout creates the feeling of switching between strings and provides an enhanced experience when playing chords. Next level Hero Powers-Use the guitar's tilt sensor or the new Hero Power button to activate one of the many newly available Hero powers. Classic strum bar- Why mess with perfection? The strum bar you know and love is back in all its glory. Return of the whammy- The classic whammy bar makes a triumphant return, to help you show off your flair. Play together: 2-player co-op multiplayer, play as Snoopy and Woodstock at the same time! Despite getting grief from his friends, a kite-eating tree, and even his own dog, good ol' Charlie Brown has remained a beloved underdog for generations of Peanuts fans. Having kids of all ages in the house, I was excited to get these 3 PS4 Games. 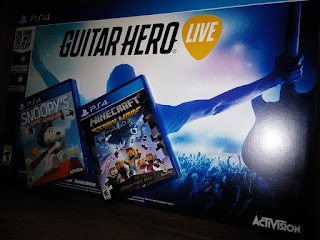 I got Guitar Hero Live, Snoopy's Grand Adventure and MineCraft Story Mode. 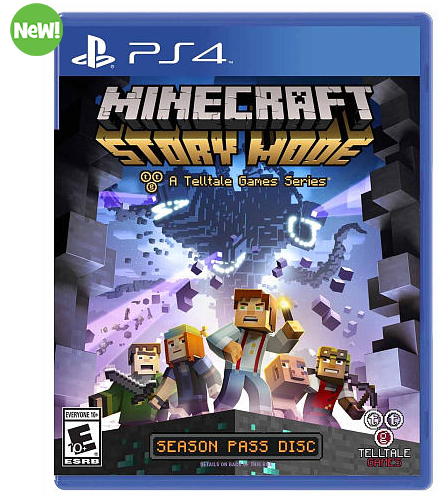 I love that there is something for all ages so everyone will be able to enjoy their time on the PS4. What I love about Guitar Hero Live is that it gets everyone out of their comfort zone and eventually getting totally into it and having a blast. 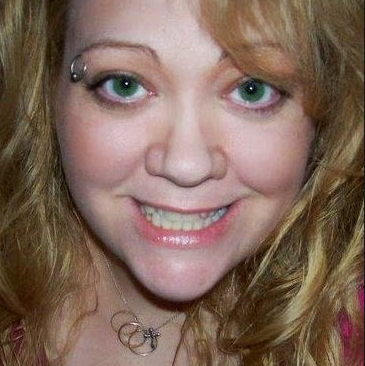 I think it is so much fun to see everyone's inner rock star. I think this is great for teens and adults. Next, age group loves minecraft, it really gets them using their communication skills and shows that their actions get reactions. Our kids love the action and adventure in minecraft. 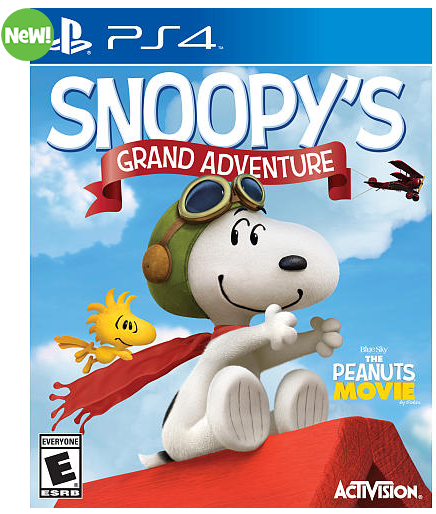 Now for the little ones, we have Snoopy's Grand Adventure and they have fun because they can play together at the same time and search for snoopy and woodstocks friends gathering items as they go on their adventure. I think all 3 games are super fun and gets the whole family involved and enjoying time together. I think all 3 would make wonderful holiday gifts that will give your family hours of fun and big smiles!